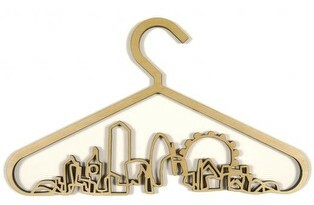 CityScapes Coat Hangers | OhGizmo! By David Ponce on 07/17/06 • Leave a comment! Since it looks like we’re going to be talking about things that you can only afford if that tree in your backyard sprouts dollar bills, how about these expensive Cityscape Hangers? They are made of hard wearing multi-laminated Birch ply, laser cut, hand-finished and varnished. There are five different cities, including New York and Paris. They come in sets of 5, and these go for ?250, which comes out to $460 (after conversion) or about $92 each. Of course, they can be ordered individually or in quantity, though we’re not sure of the price point in these cases.